We've got a hen flying over a section of fence to hide her eggs again. Our solution was to extend that fence with some 5 foot tall chicken wire. 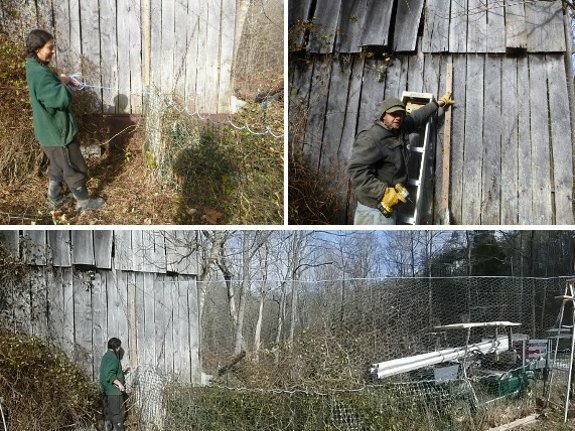 We used nylon rope to connect it to the bottom fence and got it up in well under an hour. No need to post this online! Hey! That looks great, and I am interested because I have the same need: to raise my chicken-yard fence. How is the taller fence supported in the middle? I have been looking at the whizbang plucker guy's t-post extender gadgets that he uses for putting up bean trellis'. We currently have a 4-ft fence around the so-called chicken yard that is absolutely no barrier for chickens or turkeys.